Despite the lofty reputation of old violins by Italian masters such as Antonio Stradivari, blindfolded listeners in concert halls in New York and Paris say they preferred the sound of newer instruments. The latest salvo in the long-running debate over which violins best project sound appeared Monday in the Proceedings of the National Academy of Sciences, a peer-reviewed US journal. "Because Old Italian instruments are now priced beyond the reach of the vast majority of players, it seems important to test the fundamental assumption of their tonal superiority," said the study, led by Claudia Fritz, a researcher at France's National Center for Scientific Research (CNRS). Stradivarius violins were made in the 17th and 18th centuries. Today, the instruments often fetch millions of dollars. Experts say these antiques possess the curious ability to sound quieter under the player's ear, yet project sound farther and better in a concert hall than newer models. So researchers asked musically versed listeners to compare three Stradivarius violins to three newer models, based on listener preference and sound projection. One test was conducted in a 300-seat concert hall near Paris, involving 55 listeners. The second involved 82 listeners in an 860-seat hall in New York. The instruments were played behind a screen by blindfolded soloists—sometimes with an orchestra, sometimes without. 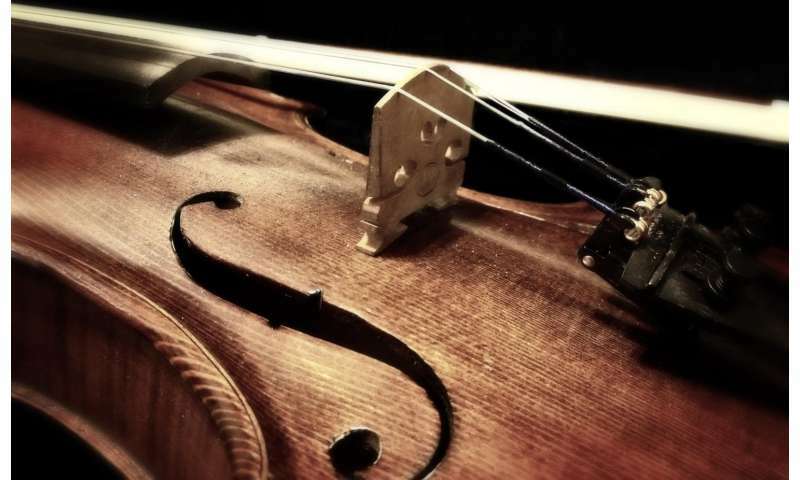 "Regardless of musical experience, listeners preferred new over old violins and found that new violins projected sound better than old violins," concluded the study. Both players and listeners were "unable to consistently distinguish new from old violins," it added. "Contrary to conventional wisdom and practice, soloists might benefit from playing new rather than old violins during auditions and competitions, provided the violins' provenance is shielded from the judges." Two of the study's authors made a conflict of interest disclosure. One was employed by a studio that builds violins and violas, and other works for a company which manufactures orchestral strings. A 2014 study based on 10 professional violinists also found that musicians—when they were unaware of which were old or new—preferred newer instruments. After playing each instrument, first in a rehearsal room and later in a concert hall, six chose new violins and four chose old ones. Probing Question: Is a Stradivarius violin better than other violins? 6 compared to 4 out of 10? Inconclusive as to which are actually best - but quite conclusive for the result that there is no significant difference. I think that probably instruments made from wood, especially the delicate ones like violins, will eventually get "played out" as they age. Something must happen to the resins and varnishes over time, not to mention the integrity of the wood itself at the cellular level. IF it were possible to compare an aged Strad to an original new Strad, all things being the same, that some time traveler brought back to the present, we would hear a notable difference. I think that probably instruments made from wood, especially the delicate ones like violins, will eventually get "played out" as they age. I make rare reeded bagpipes for a living, and reeds have many similarities to wood but vibrate much more extremely. The oldest working reed I know, from a dry-blown instrument (uses a bellows instead of mouth) is 160 YEARS old and has been used recently to verify the integrity of 1-200 year old instruments. I think it takes some very careful study to know if the material wears out in fiddles or, perhaps, the overall construction deterioration is the culprit. It's silly to imagine that older finishes made better instruments. We know a lot more today than they did hundreds of years ago. It's not surprising that modern instruments can equal the performance of older ones beyond the ability of unbiased observers to detect, for far less money. Anyone who doesn't think so is a crank. And there are a lot of superstitious crank musicians, in my experience. And even more superstitious crank music critics. I can understand why the test has players blindfolded, but playing a violin involves more than just the violin. The 'magic' is usually in the most complex part, and that is the violinist (or possibly the audience), and not the violin. What if seeing a few-hundred-year-old priceless instrument makes the violinist play better? It could be respect for the instrument, it could be just the musical equivalent of the placebo effect, etc. Then again, the Romans had better concrete than we do 2,000 years ago; and we're light years ahead of them in materials science. It's easy to imagine that one particular artist or craftsman could have developed their own technique/recipe and never passed it on. I don't have any kind of musical training, so I'm sure I would be unable to tell, but I don't think this is a case where newer automatically equals better. Actually it's an indication of neither. The sample size is too small to have good statistical power. It's silly to imagine that older finishes made better instruments. We know a lot more today than they did hundreds of years ago. They did have some materials we don't have (e.g. due to pollution we don't have the kind of 'pure' woods anymore that they had) Whether that makes a difference is questionable. Just an indication that there are things that we cannot reproduce. It's a bit like radiation testing chambers are made from the steel of old, sunken warships - because they were built/sunk before the atomic tests began they contain almost no radionucleids that contribute to 'noise'. We cannot create that material anymore because our environment is irrevocably contaminated. @Lex, confirmation bias is ubiquitous. I commented on that in a recent thread on astrology. @RealScience, there's a thing about finishes and woods that causes stringed instruments to "settle" over time; it takes somewhere over a decade and somewhere under a century. I've had it happen to two axes I own, one an acoustic and one an electric hollow-body; the acoustic is varnished, and the electric was made with gun cotton lacquer. Significantly, these are the two axes I play the most. I don't think that this effect is somatic; I have recordings to prove it. They sound better today than they did twenty years ago. But I don't think this effect keeps working forever; and I think the Stradivarius violins passed the peak of it long ago. @Shabs, I'm not sure how "better" concrete is defined, particularly when there is a Nazi bunker in Hamburg that has been left because demolishing it would put newer buildings at risk. I've been there and seen it. Roman concrete production methods are well documented; it's simply not worth the while of modern contractors to use them. We have different priorities than the Romans did. And different priorities than the Nazis, too. We could have a long conversation about concrete, but it's off-topic in a discussion about an article about musical instruments. Your devil's advocate position is noted, and respected. Overall, I think that a great deal of superstition clouds analysis of these matters, and that this study shows confirmation bias. Until we figure out how to eliminate this we will continue to flail in this area. Makes sense, a lot of credence is given older instruments without any real analysis of the differences. You can pay a fortune for a 1950's Les Paul, but I've never heard any Gibson play better than a modern Buckethead special . . . especially when played by the man with the bucket, of course. The musical tone of the newer instruments could have been "brighter" and less sonorous than the Strads. To the musically versed audience whose hearing has faded over the years, brighter is easier to hear. A great documentary called "Art of the Violin" with film footage of the great violinists playing their Srads and Guarnerius' will settle the debate. Notice the "conflict of interest" clause in the article.